PAGO PAGO, American Samoa -- Vice President Mike Pence is shortening his stay in Hawaii to a few hours so that he could fly back to Washington in what promises to be a very busy week for the administration and Congress. Pence’s office said he would depart Hawaii on Monday afternoon after meeting with U.S. Pacific Command leaders and troops stationed in Honolulu. Plans for a Tuesday visit to the USS Arizona in Pearl Harbor have been postponed, Pence’s office said. Congress has until Friday to pass a new spending package or the government will shutdown. The White House is also planning to unveil a tax reform plan this week. In American Samoa on Monday, he thanked American service members based in American Samoa, citing “challenging times” for the military in the Asia-Pacific. Completing a visit to the region and en route back to the United States, Pence addressed some 200 soldiers during a refueling stop in Pago Pago. He told the troops the Trump administration was seeking a large increase in military funding. During his stop, Pence also dedicated a sign that will greet visitors at a veterans clinic. He met with American Samoan officials and troops and then flew to Hawaii at the last stop on a tour that included a visit to the Demilitarized Zone separating North and South Korea. The trip offered evidence that Pence has become one of President Donald Trump’s chief emissaries on the world stage, patching up relations, reassuring allies still wondering what to expect from Trump and diving into international crises like North Korea. Pence’s trip to Asia was planned weeks ago. But it dropped him in South Korea just in time to deliver North Korea a stern warning from the U.S.: that “all options are on the table” when it comes to curbing the North’s nuclear ambitions, and that the Trump administration will seek support from its allies to pressure Pyongyang to give up its nuclear weapons and ballistic missile programs. 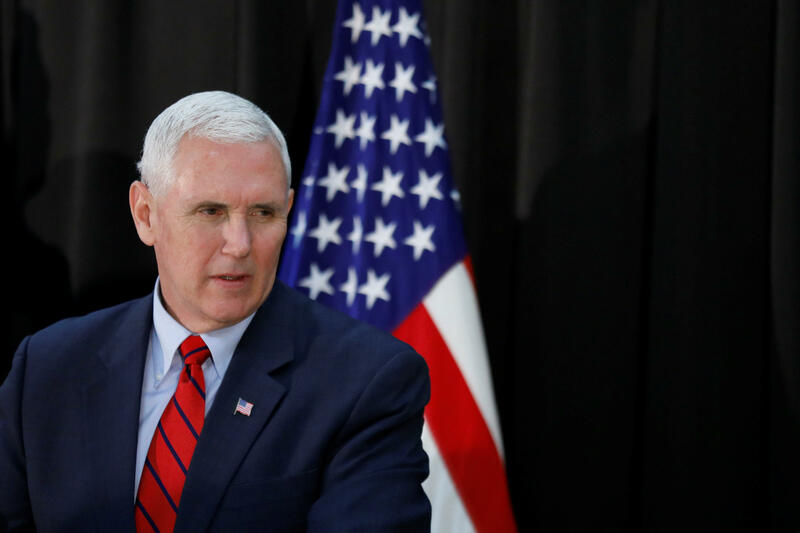 His foray into the DMZ and his meetings with South Korean and Japanese leaders allowed Pence to shape a key American foreign policy issue, presenting a new challenge for a politician whose prior foreign policy experience was limited to trips to the Middle East as a congressman and trade missions to Japan, China, Israel and Europe as Indiana’s governor. Pence’s early foreign travel schedule contrasts sharply with a mostly homebound Trump, who is not scheduled to travel overseas until late May for NATO meetings in Belgium and a gathering of the Group of Seven major industrial nations in Italy. Pence partly covered that ground when he visited Germany and Belgium in February. Trump’s predecessor, Barack Obama, had visited nine countries by late April 2009, his first three months in office, checking in with allies such as Canada, Britain and Germany. The last first-term president to wait until May to take his first foreign trip was Jimmy Carter in 1977. Enter Pence, whose still-evolving diplomatic playbook includes several components, all steeped in humility, personal ties and his religious faith. In some ways, Pence is the advance team: His earlier trip to Europe and his Asia trip that ends Tuesday are partly laying the foundation for journeys being planned for Trump. In other ways, Pence is the face of reassurance, offering in-person outreach to world leaders Trump has clashed with or who have doubted Trump’s commitment to them at the start of his presidency. In meetings with his counterparts, Pence frequently passed along “greetings” from Trump and told his hosts how much America valued their alliance, language that’s commonplace in diplomacy but understated compared to the more free-wheeling Trump. On Thursday, for example, Pence told Indonesian President Joko “Jokowi” Widodo how “proud” he and Trump were to partner with him and spoke of their hopes of working together.